How can I make a tint for a colour in Adobe Illustrator? It’s a question I’m asked regularly by Illustrator users. When you apply the default colour swatches in Illustrator to your artwork, the swatch colour is not associated with the swatch in the Swatches panel. This means that changing the colour settings for a referenced swatch colour has no effect at all on the artwork that once referenced this colour. The two are unrelated. Creating tints or shades of the colours when applying the default Swatch colours is difficult. Although you can use the Color panel, and press Shift-key whilst dragging the sliders, the colour that is created is in no way associated with the original Swatch colour. Let’s have a look at how we can define Swatch colours in such a way that both of these issues are resolved. Display the Swatches panel (Window > Swatches). From the Swatches panel menu choose New Swatch. In the New Swatch dialog that appears, set the colour breakdown. If we were to click ‘OK’ at this stage, creating a tint when applying the new Swatch colour will be difficult, and there is no link between the applied swatch colour and the swatch in the Swatches panel. You’d need to access the Color Panel, and apply the swatch colour, then whilst holding down the Shift key on the keyboard drag the colour sliders to create a lighter or darker version of the swatch colour. Before clicking OK, there’s one more step to complete: Enable the Global option in the dialog box, and (optional) name the colour. Global means editing the swatch colour consequently updated the colour of all objects to which this colour was applied within the illustration. Global colours are easily recognised in the Swatches panel, as there thumbnail is marked by a small white triangle. An added bonus of applying Global colours to your artwork means you can now much more easily apply tints of Swatch colours to your artwork, and as you edit the Swatch colour, all artwork that is associated with any tint of the colour that is applied will update to reflect the colour change. Another quick way to make tints of any colour from the Swatch panel is to go the the Colour panel and move the sliders while holding down the Shift key, in either direction. In the Colour Guide panel you will also get ready to use tints of the colour you have selected. There are definitely other techniques in Illustrator to creating tints. Thank you for adding these in the comments. I opted to write about the Global Swatch colour because these swatches retain a relationship between the colour in the Swatches panel and the artwork to which it is applied. This applies for any tints that have been applied as well. I’ve updated the description at the start of this blog-post to make that a bit clearer. Another step BACKWARD for Creative Cloud. 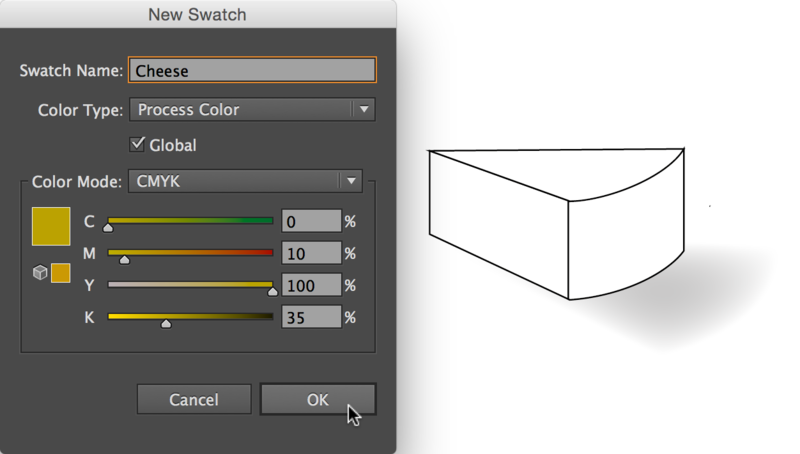 Once upon a time (in CS5) there was a simple command in the drop down menu: Create Tint Swatch. Then the color could be used at a click to apply consistent tones. Why does Adobe keep deleting functional commands? I need to learn something else. I’m tired of relying on software, becoming proficient, then having tools stolen. I realize this is over a year later, but I found the tint slider in Illustrator CC: On the Color panel there is a hamburger menu on the top right, click it and then click Show Options. Boom! The tint bar appears! BLESS YOUR SOUL! I had been earching forever!!!!! This is perfect.